What I love most about gardening is there's always new-to-you stuff to learn. I love to try something and see what happens. Last week I went to a talk by Janet Macunovich at the Dexter Garden Club. It was fun looking at photos of pretty plants and getting Janet's take on the mixed perennial border. Then, as an aside, she mentioned an alternative to overwintering tender bulbs (cannas, dahlias, and gladiolas†) inside: You can bury them deeper (at least 18 inches) in the garden instead! I left some glad bulbs in the ground to die last faIl. I'd gotten them really cheap and was treating them as annuals. But what the hey! 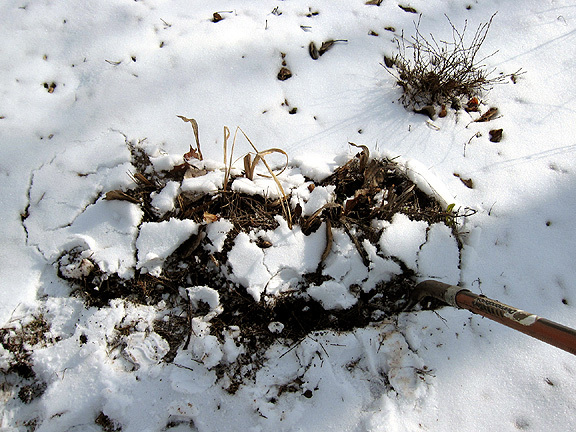 Our soil isn't frozen solid, so I decided to give burying the bulbs deeper a try. Fortunately, I didn't cut the gladiola foliage to the ground in fall, so I could actually tell where the bulbs were. 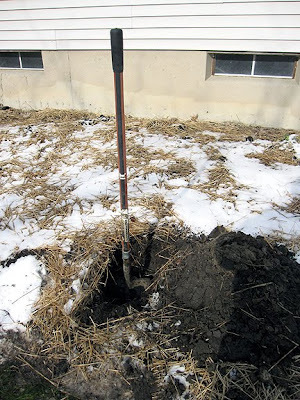 I decided to dig the storage hole in my veggie bed because that's empty over winter, and the soil there is easier to dig than my less-amended clay soil in other beds. It was pretty easy digging until about a foot down. I always forget the huge tree roots everywhere in my garden. This particular one was only an inch in diameter (a mere baby! ), but required getting out the big pruners. I live near a wooded natural area. This part of it is not 15 feet from the veggie bed. 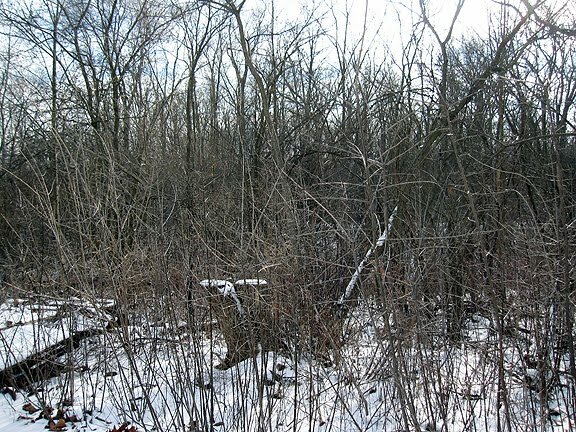 You're seeing mostly buckthorn, which has crazy long roots, but the biggest diameter roots come are from the many nearby 30-plus-feet-tall trees. I wished I had a mesh bag to put the bulbs in so I could easily pull them all up at once in spring, instead of digging around onesy-twosy. Then it dawned on me I had this decorative metal basket I got at a yard sale but never figured out how to use. So I put all the bulbs in that and set it into the base of the hole. 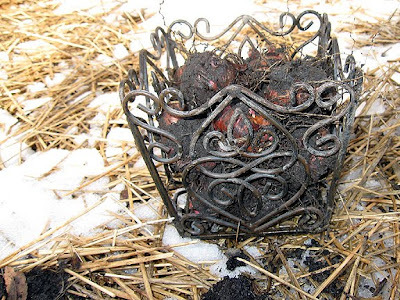 A more shallow, wider mesh basket that could hold a single layer of bulbs might have been nicer in terms of drainage, and I contemplated jerry-rigging something out of metal fencing, but that would also have meant digging a much wider hole and I was done fighting with roots. I filled all the soil back into the hole and topped the area with some pine needles for extra protection. Pinestraw tends to stay put (not blowing away in the wind or decomposing over winter), but just to be on the safe side (mark twice, dig once! 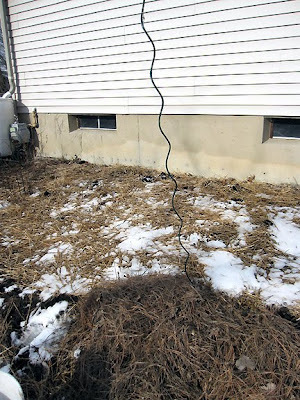 ), I stuck a locator stake in the ground just behind the basket of bulbs. In spring, I'll dig them up and move them back to the front garden bed at their normal desired planting depth. The storage hole is only to provide the bulbs with more warmth to survive the winter. If I left them that deep in spring, it would take them forever to reach the surface. Well that's that. Now we'll see what happens! † Elephant ears are more sensitive to cold and would have to be buried two feet or deeper. I keep mine in pots and bring them in as houseplants over winter. I'd not heard of that before! Looks like fun to do - I like the metal container too! Lots of work but if it is succesful you will get your reward. You certainly put a lot of work into this, Monica, but you're better than I--I completely forgot to dig up the canna bulbs I planted last summer. With the cold we had this past weekend, I think it may be too late. Looking forward to seeing your glads this summer! Love this idea Monica! You can be the advance guard, and when you have good results I'll be an early adopter! Okay Monica I'll be waiting and watching to see what happens. Look at you being all inspirational and recycle-y! I love the idea of using that basket because I was looking at it and thinking, "Hmmm, that looks a little more Goth than I would expect from Monica. Where's the 50's kitsch?" Anyway, there's an auto shop near me and out in their hell strip they planted some glads and the darn things come up every year. I don't think they're planted at the proper depth so why they don't turn to mush is a mystery. Thanks for sharing this neat idea! I'm curious to see how it turns out! Lucky break leaving up that glad foliage. I hope they all over winter for you nicely. That was a super good use for the basket! Happy New Year to you Monica. Grrr on the tree roots. That is quite a bunch of trees. Let me know how it goes. If I don't have to dig up my bulbs, that would be awesome! That's quite an experiment! I'll look forward to seeing the results! Good luck! na ja viel mehr Schnee als wir hast Du ja auch nicht. Soll ich sagen Gott sei Dank? hihihi, ich musste an Dich denken, als hier am Freitag alles verschneit war. Hatte nur so wenig Zeit, Dich zu besuchen. Ich hoffe, es geht Dir gut. Ruh Dich noch ein wenig aus, bevor das neue Gartenjahr beginnt. All my bulbs are stored safely in our frost free garage. Hope it works for you. Great idea-I hope it works! What a terrific idea! Being city bound, in an apartment without so much as a balcony, sometimes I read garden blogs just to get a little outdoorsy fix. 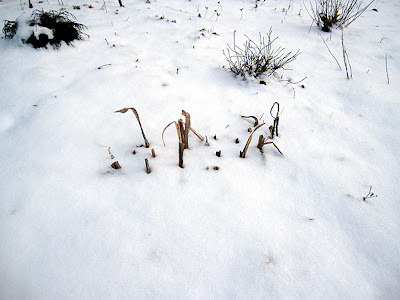 But one day, sooner than later, I hope, I will have a garden again, and then watch out! All these tips will be stored away in my noggin' and on pages like yours and I'll find 'em again. Thank you for sharing this keen idea. I hope to see how they turn out when you dig 'em up in a few months.